Start here for a basic overview of American automobile history. Concentrating on the 1920s to 1950s, large photographs of the assembly lines in action send readers into nostalgic old factories. See the workers, the tools, the methods and the machines that combined their efforts with the ingenuity of industry players like Henry Ford, Ransom Olds. Walter Chrysler, and others to make possible the automobile’s worldwide proliferation and availability. Flash back in time to witness the factories decade by decade in never-before-published vintage photographs. Featured automakers include Ford, GM and Chrysler, along with smaller companies like Packard, Studebaker, and Auburn. Once viewed as a plaything of the wealthy and eccentric, the car is now an integral part of modern life. 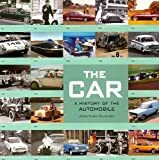 The Car takes us on a tour of the many roles that the automobile has played in its lifetime, and the many guise and different models in which it has appeared. Not just a book of glossy advertising shots, The Car is a social history of the impact that cars and driving have had on the world, and nowhere more so than in the United States: freeways, driveins, trucks and trailer parks all spring from the invention of the internal combustion engine.